About 65 percent of the human body is water and everybody knows that drinking an adequate amount per day is essential for survival. Water carries nutrients to where they are needed, flushes out toxins and waste thus refreshing your body and soul. Lack of water will cause dehydration. Dehydration is a condition which occurs when you don’t have enough water in your body so your organism cannot perform normally. Even mild dehydration can make you feel exhausted and tired. Not passing much urine when you go to the toilet. Partial or total lack of energy. Remember, if you feel thirsty, it’s too late – you are already dehydrated. 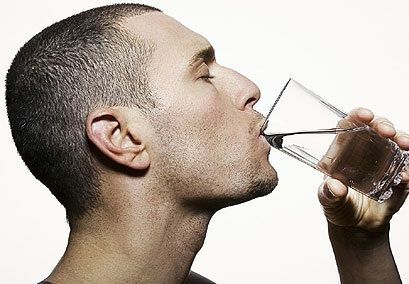 The Institute of Medicine (IOM) recommends that a healthy adult men should drink 125 ounces (3,5 litre) of water per day while women should drink 91 ounces (2,7 litre) of water per day. That seems a little high considering that 125 ounces (3,5 litre) equals about 17 glasses of water each day. Keep in mind that about 20% of daily water intake comes from food (vegetables, fruit). A good rule of thumb is to only drink water when you feel like you could drink a glass. A feeling we are all familiar with. Why Drinking Too Much Water is Dangerous? Drinking too much water can kill you. Yes, you read that right. It’s called water poisoning or water overdose. It is not the number 1 killer in USA but there are known cases of water overdose. What is considered too much? A healthy kidney can “process” about 27 ounces (800 ml) of water per hour. If you are drinking more than that you are asking for trouble. What also happens when your drink too much water is the kidneys being unable to control the amount of water in your body (you cannot pee all the time can you?). As a consequence your blood becomes saturated with excessive water. Water is naturally drawn to areas in your body where concentration of salt is higher therefore the excess water leaves the blood and enters cells. Cells get inflated like balloons. Cells can expand and shrink because they are surrounded by flexible tissue (fat and muscles). The symptoms of water poisoning are similar to symptoms of alcohol poisoning. But when water gets into neurons you are in trouble. Brain cells are tightly placed in your skull, just like sardines in a can and your skull has very little extra space to rent. Neurons share space with blood and cerebrospinal fluid. The skull has virtually no extra space for expansion (swelling). Therefore cerebral edema (swelling) can be disastrous. The rapid and severe hyponatremia causes the water to enter brain cells, which leads to swelling of the brain. As a result respiratory arrest, brain herniation, coma or death may occur.